Watching the Oscars last night, I am reminded of the many evening gowns I have worn in my lifetime. I am reminded of what it is like to mesmerize and make people gasp by that combination of a beautiful garment and the woman who brings the garment to life. It is a formula that always works. If you noticed, it is the same women who stand out, year in and year out at the Oscars. Some of the actresses, will always have class and will always carry and comport themselves with elegance and grace. You will also notice women who wear garments that are bigger than their personalities; consequently, you see them struggling with their garments or worse, the garments wear them and not the other way around. Sometimes, at American idol, you hear a comment that says the song is bigger than you; which is a nice way to say, you did not do the song justice. Well, it is the same with clothes….sometimes the grandeur of the garment overtakes a woman’s personality instead of complementing it and the result is an ‘unconvincing beauty’. Coupled with the fact that the Oscars is the ‘mother of all red carpets', women must choose with timelessness in mind. They must choose garments that will leave an indelible mark in our memories. Fifty years from now, we would like to remember you as glamorous. Last night, 3 women were memorable to me. It is not because they had the most beautiful garments but because they carried the garments, MOST BEAUTIFULLY. Cate Blanchett was the most chic for me. She chose an Armani that is subdued and elegant. She has that long neck and the tall elegant stature. In fact, she can wear anything but decides on a dark metallic silver palette that accentuates her complexion. Her choice of garment is one that is timeless; we can’t date it. Details in blood red embroidery are in the bottom of the gown. I love her fashion sense. She seems to have a knack for what is current. Penelope Cruz in a glamorous ‘ blush’ gown by Donatella Versace was a stand out because she wears the garment. The garment does not wear her. She wears the garment like it is her second skin - effortlessly. The simplicity and elegance of her hair and make-up connotes 'classic'. The phrase ‘natural beauty’ comes to mind and the choice of the natural hue accentuates the fact; the gown is a mirror of her beauty – simple with intricate detail, soft and light but with a lot of substance. Jennifer Lopez, in a jeweled taupe empire waist gown with a famous and talented husband at her side, has also succeeded in making us look at her. It is a very simple gown, probably vintage, but it is an entrance maker. She has succeeded in steering away from what people expect her to wear. I like the fact that she has her own style and that she chose a garment that takes away from her famous body and puts the attention to her beautiful face. Here is a Valentino gown worn by Anne Hathaway, and it looked contrived. I would have loved to have seen this gown on Julia Roberts. Rachel Weiss wore this silver taupe silk chiffon gown by Vera Wang. This would have looked fabulous on Nicole Kidman. The funny thing about gowns are they are constructions made to accentuate the female form. Long body types carry them very well. She looks beautiful enough, but I really think the dress is ill-fitted on her. (There must be no visible bumps in strange places). Real haute couturiers are able to fit clothes perfectly on any body type which is of course an art. This is not the case with this gown. Jodie Foster, who is a fixture in Hollywood, stomped across the red carpet in this slate blue Vera Wang gown to match her blue eyes. She donned a garment that was perfect choice for her colorwise. However, here is another example of an ill-fitting gown. It is too long for her. Sometimes the illusion of a longer hem works and makes one seem taller but when you look at the carriage of the gown as a whole, the proportions are off. Nicole Kidman will look fabulous in anything. I love her choice of color because she stood out. The trick is to choose a color that no one else will be wearing. I also love that because it was not really her night (no awards to win), she downplayed her glamor a couple of notches. Reese Witherspoon dresses for fun and is very original in her choice of gown. Representing the younger contingency, she was spot on. And yes, Helen Mirren, if you think you are going to win, by all means, sparkle and shine and wear gold. 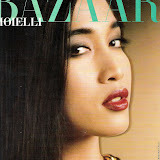 The first Asian "supermodel". 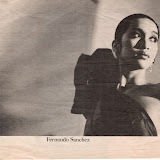 Became in the 1980's one of the top ten models of the world in only 2 years. 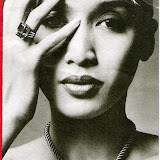 Touted the “Model of the 80s.” Worked for all the major European designers and was a muse to many important designers. Became one of the highest paid--and one of the top 3 models of that time. Worked for all the New York designers and became a design consultant to some established fashion houses. Did national & international campaigns for fashion houses and major department stores. 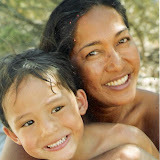 Did calendars for Elite Modeling Agency and Shiseido Cosmetics. Featured in numerous Fashion Books: Mugler, Chanel, Scaasi, Valentino, Versace, YSL, Dior, Fashion Illustrations by Antonio, etc. Photographed by many of the top fashion photographers including Helmut Newton, Norman Parkinson, Sante D' Orazio, Peter Beard, David Seidner, Olivero Toscani, Arthur Elgort, Patrick Demarchelier, Peter Lindbergh, Skrebneski, Alex Chatelain and Paolo Roversi.